ePhotoTM Version 2.0 is now available! ePhoto is the worlds first cross platform software solution that enables digital photos and videos to be viewed, stored, shared and visually searched. It is available for Windows and Mac OS X. Until now, the only way of finding images and videos was to manually scroll through images and videos one by one. Alternatively you could manually assign keywords to each item for a text-based search. But using ePhoto's visual search, you can find images or videos without scrolling and without assigning keywords. After content is automatically imported into ePhoto, it is immediately available for search using purely the visual content. You can tell ePhoto to find photos or video frames that look similar to a sample image or that share similar colors or shapes. Using advanced search, you can find photos or videos that have similar objects in them. With the QueryPad you can even draw a rough sketch and ask ePhoto to find images that are similar to your drawing. ePhoto is based on the most advanced visual search technology commercially available in the world today. Written in pure Java and database independent, the eVe Visual Search Technology will run on any platform that supports a Java Virtual Machine. With its small footprint, eVe can be integrated into any operating system, toolset or application. 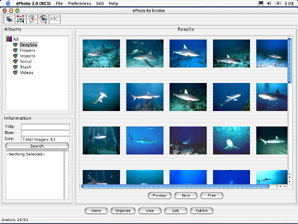 ePhoto contains all required functions for image and video ingestion and search. It has four functions: import, analysis, storage, indexing, and search/retrieval. ePhoto also extracts, analyzes, and indexes key frames from digital video, making them completely searchable. ePhoto also crawls and imports images from a specified domain URL on the web. 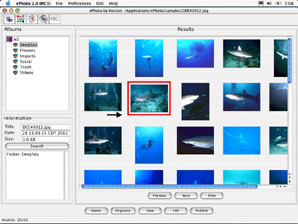 This version of ePhoto is designed to provide users a 30 day trial of eVision's ePhoto visual search product. It can be purchased by visiting the registration page. Faster image importing process (3x to 4x faster than the pre-release version). Imports large image files (tested up to 12 mega pixels). Supports 56 file types (see the User Guide for a complete list). Improved toolbar and album icons. Added video key frame grab sensitivity parameters. Added Automatic Visual Vocabulary generation. Added Automatic background processing of full analysis for advanced visual search. This process will run as long as ePhoto is running. Imports JPEG images from Web pages. Added ability to import images and video directly into a selected album. Added ability to select from a list of existing keywords to assign. Added ability to select a new target album to search using QueryPad. Added ability to change ePhoto look-and-feel (Java, Aqua, Windows, or Motif look-and-feel). Click here to view the ePhoto "ReadMe"
To Register ePhoto Click Here!